Neighbor to Neighbor in Concordia is always a beehive of activity. But recent visitors might have noticed many women at Neighbor to Neighbor busy sewing not just clothing but hand-sewn shoes as part of an outreach program. Where does all that work go? On Friday, June 23, the most recent fruits of all that sewing headed out on a journey to North Carolina, before flying onward to Uganda. Dresses, shorts and shoes are hand-sewn at Neighbor to Neighbor. “We just sent 12 boxes to North Carolina,” Sister Ramona Medina said. The boxes contained 122 hand-sewn dresses, 100 pairs of hand-sewn shorts, and 82 pairs of shoes crafted by the volunteer seamstresses at Neighbor to Neighbor. The boxes are sent to Soul Hope, Inc., a 501 (c)3 nonprofit in North Carolina dedicated to helping with foot-related diseases and medical relief, which will then distribute them to people in need in Uganda. Sister Ramona, along with Sister Pat McLennon and Sister Jean Befort direct Neighbor to Neighbor. 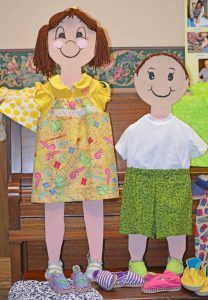 The group has been making dresses and shorts for some time, having completed more than 1,700 dresses and 500 shorts that have been distributed to children in need in Guatemala, Africa, Haiti, Jamaica, Mexico and El Paso, Sister Ramona said. Some of the clothes are distributed by local church groups on their missions in other countries. The shoes, however, fit a new need. Jiggers (Tunga penetrans) are parasites that burrow into the skin, mainly on exposed feet, causing painful, debilitating lesions and sometimes death from secondary infections. Shoes help eliminate an entry point for these parasites. The goal of this community outreach program was to create 100 pairs of shoes. “We’ve exceeded that a little bit,” Sister Ramona said. And they plan to deliver more. Many area women have volunteered time on the project, including Dorothy Bowersox, Sister Cese Green, Doris Hale, Joyce McClanahan, Vicki Menard, Annette Hood and Verna Hamel, as well as many others who lend a helping hand when they can. While Neighbor to Neighbor started with trying to meet the needs of the local community, it has now grown into so much more. Women who have learned skills, such as sewing, can use them to help reach other people in need, Sister Pat said. For more information about the programs available at Neighbor to Neighbor, visit www.csjkansas.org/neighbor-to-neighbor/ or www.facebook.com/N2NConcordia/. Throughout the world, religious congregations are remembering and celebrating the Year of Consecrated Life. One way to participate is viewing an award-winning documentary that grew out of the research of two Sisters of St. Joseph of Concordia. “Interrupted Lives: Catholic Sisters Under European Communism” debuted in 2009. Sister Margaret Nacke and Sister Mary Savoie first traveled to Eastern Europe after the fall of communism to help re-establish religious communities. They soon began researching how the communist regimes had persecuted women religious and began documenting first-hand accounts from those who had survived. The documentary was written and produced by Judy Zielinski, a Sister of St. Francis of Sylvania, Ohio, based on that research. The documentary has aired on national television and received a Gabriel award for excellence in film. Sister Margaret said an inquiry about the film made the two of them realize its importance during this Year of Consecrated Lives. “It was not until a Dominican priest called from Baltimore asking about the documentary and said that he wanted to use it in his parish for this year that I realized this may be a good documentary for our diocese,” she said. The one-hour documentary explores the experiences of sisters through interviews with survivors, coupled with dramatic re-creations with actors filmed on location in Ukraine, Lithuania, Romania, Slovakia and Hungary. Many of these sisters endured imprisonment, forced farm and factory labor, deportation, exile to Siberia, expulsion from their convents and seizure of their schools and hospitals. Parish groups that would like to view this documentary can contact Sister Margaret or Sister Mary at 785/527-2516 or write them at 602 20th St., Belleville KS 66935. One of the "assembly lines" in the Republic County 4-H Building in Belleville is in full swing Sunday afternoon, with volunteers packaging meals for Numana Inc.
With World Food Day marking its 30th anniversary in 2011, a group of people in Belleville, Kan., wanted to find a way to make an impact. Jay Lewis, standing at left, chats with Sister Mary Savoie Sunday afternoon during the Heartland Against Hunger event as two volunteers take a well-earned break. And the resulting event on Sunday, Oct. 16, was impressive: Some 700 volunteers from throughout north-central Kansas and south-central Nebraska arrived in waves at the Republic County 4-H building to assemble more than 100,000 meals in just six hours. Tragically, the food will be sent to Dadaab Refugee Camp in eastern Kenya where the statistics are even more staggering: Twenty years of civil war and a second year of massive drought in neighboring Somalia have turned Dadaab into the world’s largest refugee camp. Population estimates range up to 450,000, with up to 1,300 new refugees pouring into Dadaab every day. It’s those kinds of statistics — both of the people who turn out to first raise money and then to volunteer, against the specter of growing worldwide hunger — that led to the creation of Numana Inc., which provided the supplies for the Belleville event and will work with the Salvation Army World Services Office to get the food packages to Dadaab. 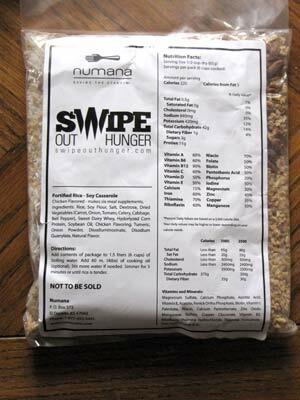 Each Numana package contains enough food for six one-cup meals. According to Jay Lewis of Numana, the Belleville event pushed his organization’s tally over 23 million meals donated to Dadaab and other areas in the Horn of Africa. “Not bad for just two years,” Lewis says. 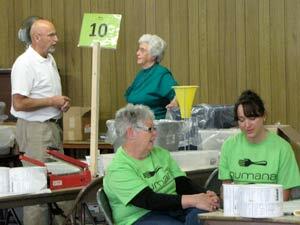 Rick McNary of El Dorado, Kan., began Numana as a meal packaging organization aimed at international hunger relief. Numana works with volunteer groups to organize packaging events and then provides all the food, equipment and supplies needed to package it. To learn more about Numana, CLICK HERE. The idea for the Belleville event began with the Republic County Ministerial Association, of which Sister Mary Savoie is a member. Other churches and service groups were recruited to join the effort, and those interested came together to form a steering committee, and to meet with Lewis and begin the partnership with Numana, at the end of July. Lewis recalled that at that meeting, the discussion began with a goal of 20,000 meals but enthusiastic organizers had pushed it up to 100,000 by the end of the evening. 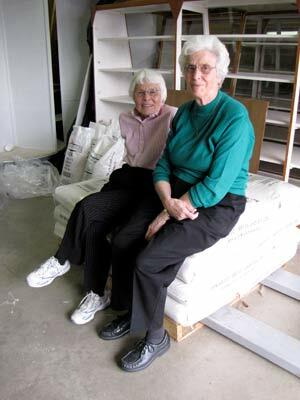 Sisters Margaret Nacke, left, and Mary Savoie, who both live and serve in Belleville, were instrumental in organizing the packaging event on World Food Day Sunday. The group — with representatives from Republic, Cloud and Jewell counties in Kansas and Thayer County, Nebraska — named themselves Heartland Against Hunger. And their first order of business was raising the $30,000 needed to pay for the food that would go into their 100,000 meals. Sister Margaret Nacke, who was a member of the steering committee, received a $1,000 donation from her congregation, the Sisters of St. Joseph of Concordia. Most of the other donations were much smaller, but they came from groups and individuals throughout Heartland’s region, Sister Margaret said. By the end of the day Sunday — just 80 days after that initial July meeting — the total raised was $32,567. The number of meals packaged reached 100,008. The Belleville event drew participants from as far away as Salina, including about 10 Sisters of St. Joseph from Concordia, and it was just one of six Numana food packaging days this weekend, Lewis said. All were in relatively small towns, like Belleville, but he was excited about the turnout on World Food Day. 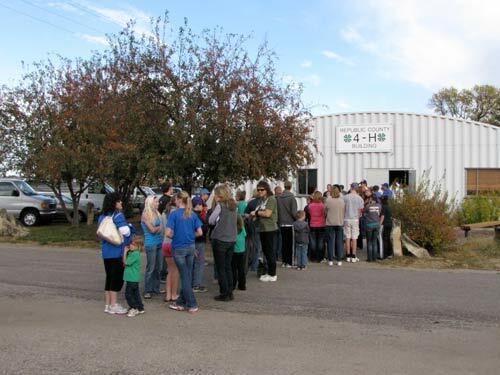 Volunteers line up outside the 4-H Building as they wait to register for the beginning of their "shift" Sunday. An estimated 700 volunteers took part over the course of the day. 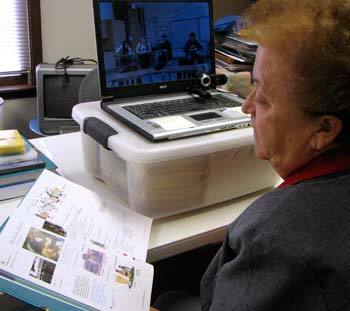 Sister Regina Ann Brummel leads her class in a simple conversation in French, via video conference from her office in Concordia to their classroom in Belcourt, N.D. In their 50-minute class each morning, they hear those repeatedly from Sister Regina Ann Brummel, sitting in front of her laptop computer roughly 750 miles away. Sister Regina Ann review the French I textbook as students practicing ordering in a coffee shop. The 17 students in the French I class and Sister Regina Ann are an experiment for the school on the Turtle Mountain Band of Chippewa Reservation near the Canadian border. Last year for the first time, the North Dakota Legislature added some specific classes to the high school graduation requirements. Now students must complete a year of a foreign language, a Native American language or a career and technical education course. Spanish was already being offered to the 565 students at Turtle Mountain, as was a class in Mechif, a mixed language that is primarily based on French, Cree and Ojibwe with a little English thrown in. School officials also wanted to offer French — in large part because of the French influence on the native Mechif — but there were no instructors available for the relatively small school. Students in their Turtle Mountain classroom play the roles of waiter and customer as Sister Regina Ann listens to their pronunciation. That’s when Andrea Laverdure, a guidance counselor at Turtle Mountain High, asked Sister Regina Ann if she would be interested. Laverdure’s mother, Betty, and Sister Regina Ann are longtime friends who have collaborated on a number of projects over the years. They met in 1975 when they both took part in the West African Ethnic Heritage Seminar; Betty Laverdure was the only Native American to join the group in its tour of West Africa and Sister Regina Ann had just started on the faculty of Marymount College teaching French. Regina Ann, who has a master’s degree in French from the University of Kansas plus a master’s in international relations from the University of Denver and who taught at Marymount for five years, would eventually also earn a Ph.D. from the University of North Dakota in multicultural higher education. One curious stumbling block to the plan to have her become the first video-teacher at Turtle Mountain, however, was that Regina Ann does not have a certificate to teach high school in North Dakota. She’s in the process of remedying that through a class she’s taking at Kansas State University this term, and she’ll follow that up with additional work at Newman College next year. The next stumbling block, of course, was the technology. 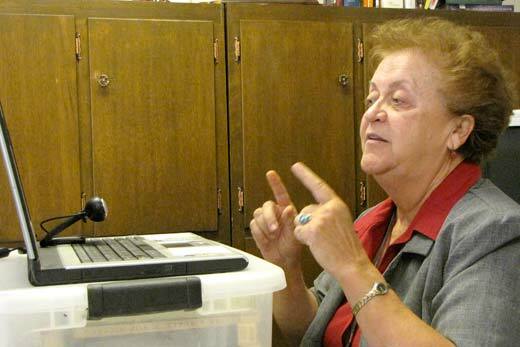 Turtle Mountain is equipped with state-of-the-art video equipment — but the sisters’ Administration Center, where as a member of the congregation’s Leadership Council Regina Ann has her office, does not have the “bandwidth” (or computer speed) to accommodate it. So at a little after 8 each morning, Monday through Friday, she fires up the Skype video phone call software on her laptop and waits for her class to call from North Dakota. 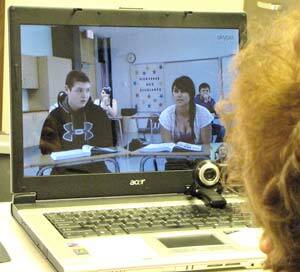 A teacher aide at Turtle Mountain provides the technical assistance on the north end of the video call, and at 8:15 the students fill the small screen on top of Regina Ann’s desk. For the next 50 minutes, the students on this day practice a conversation about ordering café in a restaurant. And each time they repeat, it’s with a little more confidence. 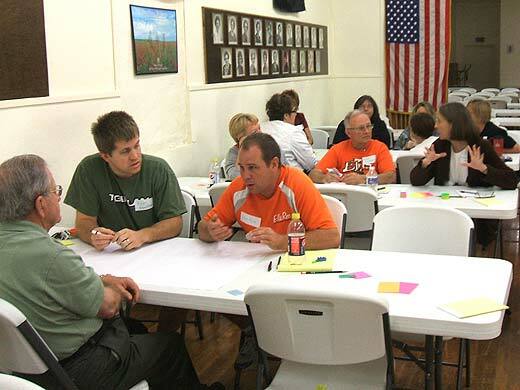 Serving in a new way: A conversation in Ellis, Kan. Participants at Saturday's "community conversation" in Ellis, Kan., discuss what they like most about their city. The director of the Ellis Alliance had been thinking about a “community roundtable discussion” for some time. But, says Dena Patee, she was reluctant to propose, let alone lead, such an event herself. In a city of just 2,000 residents, she knew it would be difficult to appear neutral. “There’s a tendency to think you’re taking sides, or promoting one idea or another,” Patee said. Ellis Alliance Director Dena Patee, left, and Alliance Board member JoAnn Schoenthaler discuss what would make Ellis even better. Enter Cheryl Lyn Higgins, the coordinator of Neighborhood Initiatives and the leader of last Saturday’s “community conversation” in Ellis. One of the many goals of Neighborhood Initiatives, which is a new office of the Sisters of St. Joseph of Concordia, is to reach out to communities where sisters serve and offer whatever assistance is needed in bringing people together to talk about challenges and solutions. Sister Doris Marie Flax has served as pastoral minister at St. Mary’s Church in Ellis since 1994, and introduced Higgins to Patee and several other community leaders. As a result, Higgins offered her services — free of charge — to organize the Saturday meeting and then walk the 20 or so participants through the process of really looking at their community. According to Patee, Higgins was exactly the person needed to start the conversation. And, she notes, everyone at the meeting knew that Higgins was just there to help. Higgins’ assistance — and, in fact, the creation of Neighborhood Initiatives in 2010 — continue a tradition the Sisters of St. Joseph have lived out since their founding 128 years ago. In their early days in Kansas, the congregation founded schools and hospitals to educate young people and provide health care, services that were crucial in the communities where they lived and served. As the need arose, they founded orphanages and nursing homes to provide care for children and elders who needed it. 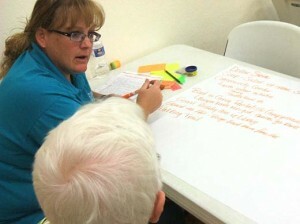 The process began with small groups listing “What we like about Ellis,” and items like good schools and active organizations were included by almost every group. Then came a harder question: What would make Ellis even better? Participants came up with a list of 14 suggestions, ranging from developing more housing of all types to creating a business incubator and building a community center. The final two questions were the hardest: What are the priorities and who will work toward them? Ultimately, four topics made that list — housing, business development and a business incubator, a community center and cleanup of Big Creek — and participants volunteered to serve on a committee for each one. The next step in the process, Higgins said, is to present the four goals, as well as other information from the meeting, to the Ellis Alliance Board of Directors and then to the Ellis City Commission. That should happen early in October. Meanwhile, Higgins is looking at other cities where there are Sisters of St. Joseph with the hope that Neighborhood Initiatives can be of service there, too. The program is funded by the Sisters of St. Joseph so there is no cost to the cities that participate. Sisters, staff, family and friends came together Saturday evening to begin the annual 12-hour Cloud County Relay for Life. The 22-member Nazareth Motherhouse team, led by captains Alfreda Maley and Sister Dorothy Marquez, joined scores of others from throughout Cloud County in the annual fundraiser for the American Cancer Society. This year’s event was held at Concordia city Park, beginning at 6 p.m. Saturday (Sept. 10). It concludes at 6 a.m. Sunday. After the ceremonies that marked the start of the Relay, the walking itself began — with a lap through the park by cancer survivors. They were joined by their family and caregivers near the swimming pool and together released dozens of balloons into the balmy evening sky. The Motherhouse team raised $4,597 this year through the sale of luminarias honoring cancer survivors and those who have died of the disease. Together, the half dozen or so teams that took part this year raised $27,845. In 2010, the Concordia event raised $29,900. The Motherhouse team also raised funds with their concession stand, selling hamburgers, hot dogs, chips and drinks. Sisters on the team this year were Sisters Lucille Herman, Betty Suther, Marcia Allen, Slyvia Winterscheidt, Ramona Medina, Esther Pineda and Shirley Meier. Other team members were Katie Koerber, Cam Koerber, Jesica Collins, Kayla Ramsey, Cheryl Lyn Higgins, Dottie Vohs, Marcia Mick, Rita Collette, Mary Jane Gallagher, Rope Dorman, Michelle Gallagher, Tryston Jochems and Vikki Jochems. Greg and Jerry Gallagher and Burl Maley were also on hand to help with the cooking and set up. For Father Jim Hoover, becoming chaplain at the Nazareth Motherhouse is the natural next step in a lifelong connection to the Sisters of St. Joseph of Concordia. And beginning today (Aug. 16), he celebrates Mass with them in the Sacred Heart Chapel at the Motherhouse, succeeding Father Jack Schlaf, who has retired after five years as chaplain. Father Jim definitely does not see his new role as a step toward retirement. Instead, he sees the chaplaincy as a new opportunity to serve God and the women who have always been a part of his life. He was born the youngest of three children, to parents who were active Catholics in the rural Junction City area. His mother Josephine had attended the school run by the Sisters of St. Joseph there, and even boarded at the convent during the school week. Jim was ordained a priest in 1960, and was headed toward becoming a canon lawyer when he discovered his love of ministering one-on-one with people in need. 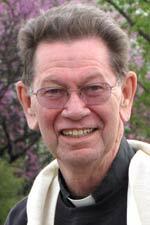 Instead, he served in parishes across the Salina Diocese. After earning a master’s degree from Creighton University in Omaha, Father Jim returned to Salina and spent the 1970s working with Sister Christine Doman — providing another connection to the Sisters of St. Joseph — on religious education throughout the diocese. But he remained committed to parish ministry. They also discovered a shared vision of working with people in small parishes, and being available for human needs as they arise. They found they shared a core belief in the compassion of Catholicism, and the deep human desire to find and feel faith. Over time, they also developed a vision of working together, to join their separate strengths into one ministry. Their chance to put that vision into practice came in 1994 when Bishop George Fitzsimons decided to give the partnership a try, in Oberlin, Kan., and two neighboring western Kansas parishes. Father Jim was assigned as the priest while Sister Marilyn served as what was then called a pastoral administrator. They served together for eight years there, and then in 2002 were assigned an even greater challenge: the four parishes, Catholic grade school and 500 families strewn across 900 square miles of Washington County, Kan. In July 2009, Bishop Paul Coakley reassigned Father Jim to the central Kansas parishes of Wilson, Dorrance and Holyrood, still with Sister Marilyn at his side. Their 17-year partnership ended last month when the Sisters of St. Joseph turned to Father Jim to serve as their chaplain and Father David Metz asked Sister Marilyn to return to the parishes in Washington County. Father Jim might have taken the more common path for older priests: He could have served as a part-time, “fill-in” celebrant, helping to relieve the chronic shortage of priests in parishes everywhere. He’s done some of that, he notes. Recently he filled in at his home parish in Junction City. And the people, he stresses again, are paramount. He’ll have a chance to get to know the people in Belleville, Munden and Cuba, Kan., as he helps Concordia’s Father Barry Brinkman as a fill-in in those churches. And, of course, he already knows the people of his new congregation at the Motherhouse. Father Jack Schlaf has retired after five years as chaplain at the Nazareth Motherhouse of the Sisters of St. Joseph. He will be returning to Fort Collins, Colo., where he lived for a year before coming to Concordia. 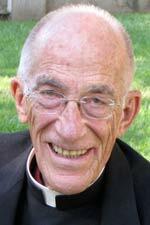 Before that, the 72-year-old Nebraska native had served his entire priesthood in the Grand Island Diocese. Father Jack celebrated his final Mass at the Motherhouse on Monday, Aug. 15, the Assumption of Mary. Traditionally, this was a date on which many of the Sisters of St. Joseph entered the congregation. Father Jack also served throughout the Concordia area, filling in when needed at the parishes in Belleville, Munden and Cuba, Kan., and ministering to the Sisters of St. Joseph at Mount Joseph Senior Village. 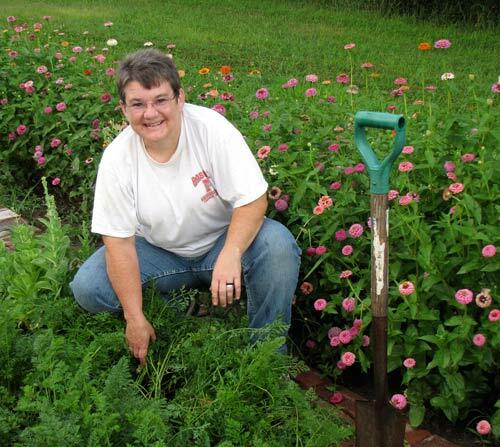 Sister Pat Eichner in her garden at the home she shared with three other members of her congregation in Concordia. With a master’s in business administration from the University of Nebraska at Kearney and five years experience as finance officer for her congregation, Sister Pat Eichner clearly has a head for business. But her heart has always been in parish ministry. Now her head and heart come together as she takes over as parish minister in Greeley, Neb., working with Father Don Buhrman. For Sister Pat, it is also a return to her home diocese and a chance to be closer to her parents and siblings. “Having Sister Pat here as a religious presence is going to be huge,” Father Buhrman said. 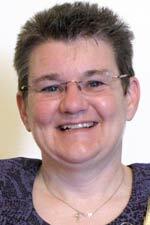 “It means we’ll be able to do so much more in terms of pastoral ministry and adult education. “And with her background in finance, it ensures that we are responsible and accountable in our parishes,” he added. Her parents Don and Mary still live in Sister Pat’s hometown of Ogallala, as do her sister and brother-in-law, Terry and Calvin Hoover, and their two sons. Her brother Tim, wife Becky and their four daughters live in Scottsbluff. Sister Pat was received into the Sisters of St. Joseph of Concordia in 1986 — coincidentally, both she and Father Buhrman celebrated their 25th jubilees this summer — and then she served as a youth minister in Salina from 1991 to 1993. For the next six years, she had the same duties in North Platte, Neb., and in 1999 became the pastoral minister in Gothenburg. In 2006 — as she was working toward her MBA — the congregation’s Leadership Council asked her to come to Concordia to serve in the finance office. But, she concedes, her heart was always in Nebraska, and with the people in the parishes. She also relishes being the first Sister of St. Joseph of Concordia working in these parishes. Until November 2009, when Sister Roberta Semper died, Dominican sisters had always served the parishes. “Through me, the people there will get to know all of our community,” Sister Pat said. And she doesn’t expect any hesitation from the parishioners. On Sunday, June 12, I completed six peaceful days in a spiritual retreat at Manna House of Prayer in Concordia, Kan. That time to recharge turned out to be vital because by noon the next day I had received the expected phone call from the Red Cross and by 7 a.m. Tuesday, June 14, luggage in tow, I was headed to Montana for a 17-day disaster assignment. At the airport in Bozeman, Mont., I joined seven other volunteers from throughout the U.S. who were awaiting the arrival of the “Red Cross shuttle” to the temporary headquarters in Billings. We were joining about 60 other Red Cross volunteers who were scattered throughout the flood-ravaged areas of Montana. Volunteers were rotating in and out as they tended to managing the disaster headquarters, assessing damage from the massive May floods, opening case files to provide financial assistance, operating shelters for the flooded homeless, delivering and serving meals and supplies, warehousing, nursing, providing mental health services and on and on. Many volunteers are retirees; some are unemployed; some are using vacation time to serve. Those who took on this assignment ranged in age from 18 to 75. Eighteen-year-old Sean opted to waive his high school graduation party in order to be available for this disaster. Thirty-one-year-old Martin was devoting his six weeks of vacation to his volunteer duties. A veteran of three military tours in Iraq, Martin most recently responded as a Reservist in Japan — sleeves rolled up in the tsunami waters removing human casualties. Seventy-five-year-old Sue had just completed two weeks in Joplin, Mo., where she trained and supervised 10 four-person teams that tended to the needs of families who lost members to death in the tornado. For me, at 65, this was my second summer responding to calls from the North Central Kansas Chapter of the Red Cross to volunteer as a Disaster Mental Health Counselor. In July 2010, I went to the Rio Grande area of Texas to help in the aftermath of Hurricane Alex. This summer it was the Crow Reservation, south and east of Billings, and more flooding. In the course of my 17 days, I physically re-located seven times. My luggage remained packed and ready for the next site to serve. Since my primary role within Red Cross is that of mental health, I remain attentive to the pulse of those directly affected by the disaster, as well as the volunteers who are tending to the victims of the disaster. What an awesome match for me as I continue to live the Gospels as expressed by my Sisters of St. Joseph of Concordia: loving God and neighbor without distinction! It just seems so natural for me to show up, be present and keep my sleeves rolled up. I traveled with another volunteer, Cheri, into homes for disaster assessment and to support her and the families as she opened cases. While she was documenting the facts, I listened to human stories of loss, of waiting and of destruction. While we were driving to another home, I listened with Cheri as she de-briefed in readiness for the next assessment and potential case opening. She was in her first Red Cross assignment, and she said I helped keep her sane. We were a splendid team! With the exception of my Red Cross peers, all of my interactions were with men, women and children among the Crow Tribe. The shelter and the homes we visited were all on the reservation; the interactions I had each day with flooded households included only the Crow. 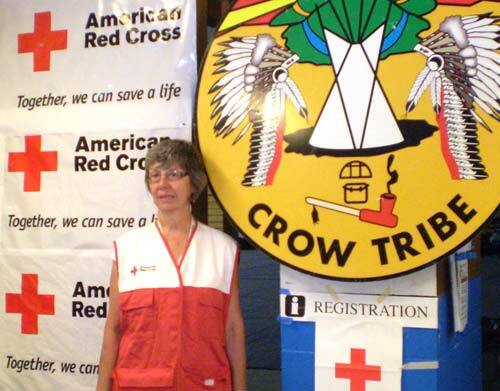 We volunteers were blessed to have a Native American liaison with Red Cross to assist in bridging gaps between the ways of “white privilege” and the Crow. Another way to work at bridging those gaps is through the children. One such experience was a day when I was reading a book with — versus to — a child and responding to the child’s questions about my hair texture and skin color, while one of the adults in the family initially listened close by, That allowed the window of trust to open with the adult, and hands and names and hugs were more easily reciprocated when I eventually introduced myself to the rest of the family. Three weeks later, that man and his family of five remained homeless and were still living in the shelter, separated from the familiarity of their food and ways within their own home. Those same three weeks later, I am among the blessed to have a home to return to, with a heart filled with graced and priceless moments. — Sister Loretta Jasper is a member of the Sisters of St. Joseph of Concordia, Kan. The Cawker City native holds a master’s degree in mental health counseling from Truman State University in Kirksville, Mo., and a post-graduate certificate in play therapy from MidAmerica Nazarene University in Olathe, Kan. For the past two years, she has worked in a government-funded program that provides support for military families where one parent is deployed to Iraq or Afghanistan. She will return to that job when school begins in the fall. Sister Marcia Allen writes about summertime — and it’s a busy one for the Sisters of St. Joseph. Discover Camp, a fact-finding visit to El Paso, two new sisters and the annual celebration of jubilarians, all packed into 16 pages. Check out all of those plus our regular features, including our calendar of upcoming events. The downloadable PDF is created in two-page spreads so you can see the Discover Camp photos and the color photos of the jubilarians exactly as they appeared in print. CLICK HERE to download the entire issue.